Hello Modern Jeepers welcome to Episode Number 11 of The ModernJeeper Show… the show about Jeeps, Jeeping and Jeepers. This week Mr. ModernJeeper, Corey Osborne, is once again on the road, hanging out at Arby’s. 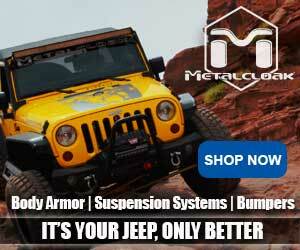 Metalcloak’s Matson Breakey and Corey discuss the upcoming Unlimited Off Road Expo in Texas, the Jeep Gladiator pricing and their $100,000 Launch Edition giveaway, and what we expect to see at Easter Jeep Safari this year. Then we are joined by the owner of Rugged Radios, Mr. Greg Cottrell. We break down his 25 year career in the communications business, how he was born into the off-road industry, why you absolutely would hate living where he lives, why he’s looking forward to street tacos and coffee, why the engine in his ’32 really isn’t, how his life experiences influence his builds, what he truly thinks of the Gladiator, what UHF, VHF and GMRS is and which one he is betting the future on, why the world is evolving away from CB, how his eyesight affected his life, and what really makes Rugged Radios the standout company it is. And, of course, we have another great Tech Tip of the Week. Greg helps us understand antennas and how to go about tuning your antenna, CB or radio, with a SWR Meter. As always, ModernJeeper is extremely grateful to our supporters including Warn Winches, Raceline Wheels, Bestop, Milestar Tires, Rugged Radios and, of course, Metalcloak. ModernJeeper is a collection of amazing off road enthusiasts and Jeep lovers coming together to bring you cool stories, great tips and awesome reviews. Control Arm Upgrade – For my Dodge Ram!